This hearty vegan, high-protein, egg-free, dairy-free and possibly gluten-free dish (if tamari sauce is used) goes well as a side or main dish on the family table and can be paired with white rice, brown rice, bread, couscous, pasta, baked potatoes, orzo, grains, quinoa or other gluten-free alternative. The recipe only contains 8 main ingredients, and the leftovers freeze well too! If you don’t have any fresh Shiitake mushrooms on hand, this dish can still be made using dried Shiitake mushrooms. Don’t know how to use dried Shiitake mushrooms? Read here for tips on how to prepare dry Shiitake mushrooms for cooking. If you don’t have Shiitake mushrooms on hand, you can use white button mushrooms or Cremini mushrooms instead. My father enjoyed this Shiitake Mushroom Lentil Stir-Fry which has now become part of his weekly dinner menu rotation. I hope you will enjoy it too! 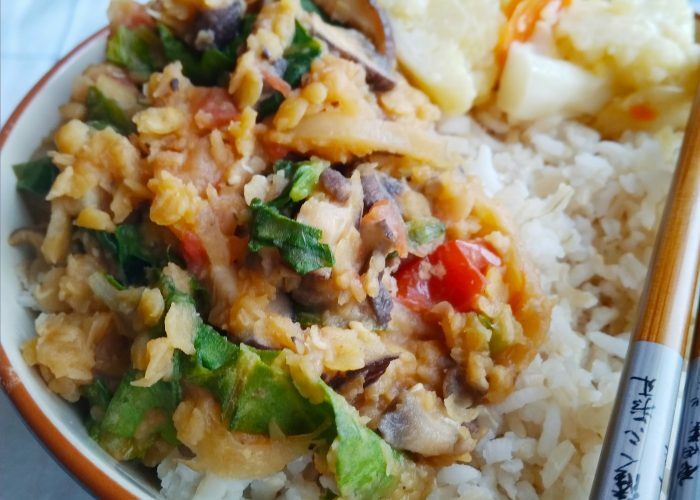 A delightful nutritious, vegan, high-protein, egg-free, dairy-free, gluten-free (if tamari sauce is used) Asian dish that can be easily prepared for a quick but tasty and filling meal. Cook the red lentils following the directions here (If you already have leftover cooked lentils prepared, skip to step 2). Remember to drain the lentils of excess cooking liquid (using a strainer over a bowl) as soon as the lentils are cooked. Wash the baby spinach and kale leaves (or regular spinach leaves) well under cold water, then pat dry with paper towels, before chopping up into bite-sized pieces. Meanwhile, heat up the half tablespoon of oil in a saucepan or skillet on medium heat. Once the oil is hot, sauté the garlic and onions in the oil for 1-2 minutes, then add the diced tomatoes. Mix to combine and sauté for about 3-4 minutes. Add in the diced mushrooms and stir again to combine. Cook for about 2-3 minutes or until the mushrooms pieces are soft and cooked through. Using a wooden spatula, move the chopped mushroom, tomato and onion mixture to the side of the saucepan and pour the remaining half tablespoon of oil on the empty side of the saucepan. Add in the drained lentils and mix it with the 2 ½ teaspoons of soy sauce (or tamari sauce) and the ground black pepper (optional). You may use less soy sauce or tamari sauce if desired. After about 2-3 minutes (or when the lentils are heated through), add in the chopped baby spinach or kale leaves. Stir and cook for another 2 minutes until the vegetable leaves are just wilted. Taste and adjust seasonings as needed. Serve warm. To make this recipe oil-free, use a bit of vegetable broth instead of the oil to sauté the garlic, onions and lentils. If you don't have Shiitake mushrooms on hand, you can substitute the mushrooms with white button mushrooms or Cremini mushrooms. Nice to take such a protein rich meal for dinner. Yes, and easy to make too. Thank you Megala!